Cherry lovers rejoice! 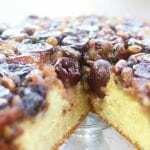 Cherry Pistachio Upside Down Cake recipe has caramelized cherries and pistachios with a moist, from scratch cake. This cake can be made anytime of year! In a medium sized bowl or stand mixer mix together 1 stick butter and brown sugar until creamed. Spread evenly onto bottom of springform pan. Set aside. In a separate medium sized bowl, or washed stand mixer cream, 1 stick of butter with white sugar until fluffy, about 5 mins. Make sure to scrape down sides off bowl at least once. Meanwhile sift together dry ingredients in a separate medium sized bowl. Mix in vanilla and 1 egg at a time to butter and white sugar mixture until light and fluffy. Add half of yogurt and half of dry ingredients and stir until just mixed. Scrape down side of bowl and repeat with second half of yogurt and dry ingredients making sure to not over mix. Place frozen cherries and nuts evenly over brown sugar topping. Spoon cake mixture over topping and spread evenly. Bake in center of a 375℉ for 50-60 mins or until cake tester comes out clean. Let rest for about 10 mins or until fruit and glaze stop bubbling. Invert onto serving platter (see notes above for directions how to invert). Cake can be eaten warm or at room temperature.